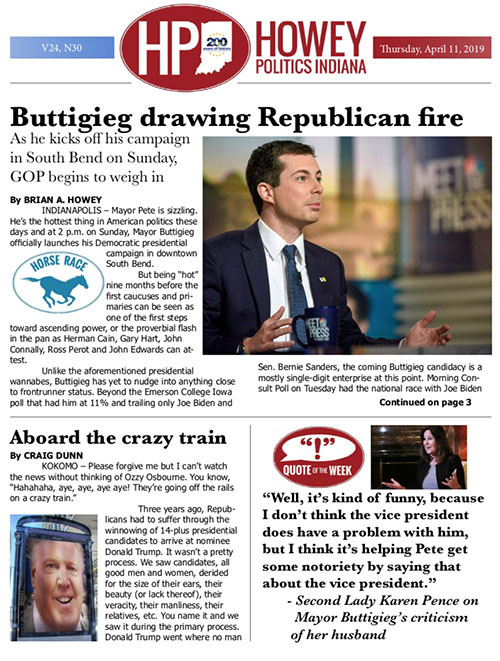 INDIANAPOLIS – Mayor Pete is sizzling. He’s the hottest thing in American politics these days and at 2 p.m. on Sunday, Mayor Buttigieg officially launches his Democratic presidential campaign in downtown South Bend. But being “hot” nine months before the first caucuses and primaries can be seen as one of the first steps toward ascending power, or the proverbial flash in the pan as Herman Cain, Gary Hart, John Connally, Ross Perot and John Edwards can attest. Unlike the aforementioned presidential wannabes, Buttigieg has yet to nudge into anything close to frontrunner status. Beyond the Emerson College Iowa poll that had him at 11% and trailing only Joe Biden and Sen. Bernie Sanders, the coming Buttigieg candidacy is a mostly single-digit enterprise at this point. Morning Consult Poll on Tuesday had the national race with Joe Biden leading with 32%, Bernie Sanders 23%, Kamala Harris 9%, Beto O’Rourke 8%, Elizabeth Warren 7%, Buttigieg 5%, Cory Booker 4%. Buttigieg was at 1% in mid-March and 3% last week. A Saint Anselm College Survey Center poll in New Hampshire released Wednesday had Buttigieg at 10.7%, trailing Biden at 23% and Sanders at 15.6% (and ahead of Warren). If anything, he’s made the cut with the talking heads commentariat, earning praise from New York Magazine’s Andrew Sullivan to the Wall Street Journal’s Gerald Seib. And he appears to be closing in on a top-third echelon in the sprawling Democratic field approaching 20 candidates. Hupfer added that prior to becoming a potential presidential contender, Buttigieg spoke for years on the need for more civility in politics. “These unhinged, mean-spirited attacks from Buttigieg on Vice President Pence are a complete reversal from the relationship they shared while they both held public office in Indiana,” Hupfer said. So if nothing else, Buttigieg has gotten the attention of Hoosier Republicans. The reality is that anti-Trump/Pence rhetoric will fuel Buttigieg’s candidacy for a Democratic constituency. Andrew Sullivan describes in New York Magazine a potential showdown along the lines that Indiana mayors described to HPI last week: “Trump would be the oldest president in history at 74; Buttigieg would be the youngest at 39. Trump landed in politics via his money and celebrity after years in the limelight; Buttigieg is the mayor of a midsize midwestern town, unknown until a few weeks ago. Trump is a pathological, malevolent narcissist from New York, breaking all sorts of norms. Buttigieg is a modest, reasonable pragmatist, and a near parody of normality. Trump thrives on a retro heterosexual persona; Buttigieg appears to be a rather conservative, married homosexual. Trump is a coward and draft dodger; Buttigieg served his country. Trump does not read; Buttigieg does. Trump’s genius is demonic demagoguery. Buttigieg’s gig is careful reasoning. Trump is a pagan; Buttigieg is a Christian. Trump vandalizes government; Buttigieg nurtures it. It underscores what Purdue President Mitch Daniels told HPI late last year, that Americans have a tendency to go in a completely opposite direction from one election cycle to the next. And that concept is what makes 2 p.m. Sunday in South Bend a potentially significant milepost in the 2020 presidential race. Many Democrats are hearing that their nominee will really matter if they want to end Trump’s political career, particularly if they want to rebound in rural America. Sen. Sanders’ socialist agenda, built on his Wednesday proposal of a robust “Medicare for All” campaign cornerstone, would give President Trump his ideal matchup. Sanders’ $18 million first quarter haul means he will be a force in Iowa, New Hampshire and then California on Super Tuesday. That’s the state where Buttigieg or Sen. Kamala Harris might represent a retaining wall against a potential barrel-roll into socialism. Biden is the current polling frontrunner and along with Sanders sets up the critical JFK-inspired generational contrast with Mayor Pete. Washington Examiner columnist Byron York explains, “Voters are clearly open to older candidates. President Trump, born June 14, 1946, is the oldest president ever to take office, 70 years old on inauguration day, a few months older than Reagan when he took power. And of course, Trump defeated Hillary Clinton, born Oct. 26, 1947, who, had she won, would have been the same age as Reagan, 69, upon taking office. Americans elect a president with the understanding that he or she might serve eight years. If that were the case with a President Sanders, he would be 87 years old on leaving office, and a President Biden would be 86. Beyond generational and religious contrasts, Buttigieg will use his South Bend backdrop Sunday to highlight his experience. Perhaps the question asked most often to this point is whether the mayor of a 100,000-population city is capable of handling the demands of the presidency. Buttigieg made clear Sunday morning that South Bend will become a campaign metaphor. “There’s the sense we’ve really changed the story for our city,” Buttigieg told moderator Chuck Todd. “I think that’s something the country needs to hear because you’ve got a president who’s telling anybody from a community like mine, be it an industrial community or a rural community where people (are) growing up, means getting this message that success means you have to get out. “There’s so much work to do in a community,” Buttigieg said, describing his city. “People know it’s home to Notre Dame. They might assume it’s a wealthy, homogenous college town. We’re a city that was devastated by the loss of industry, especially when the auto factories left in the 1960s.” That was a reference to the 1963 collapse of Studebaker and the loss of companies like South Bend Troy, South Bend Watch, South Bend Lathe Works, AlliedSignal and more job loss at Bendix and Honeywell. Buttigieg is preparing for a contrast not only with 70-something Democratic frontrunners Joe Biden and Bernie Sanders, but President Trump, who won Indiana with a 19% plurality in 2016. Todd asked the mayor, “Are you a capitalist?” after Trump has invoked his opposition to “socialism” that began with his State of the Union address last winter. Buttigieg responded, “Sure. America is a capitalist society, but it’s got to be democratic capitalism and that part is really important. It’s slipping away from us. When capitalism comes into tension with democracy, which is more important? I believe democracy is more important. When you have capitalism capturing democracy, when you have a regulatory capture where powerful corporations are able to arrange the rules to their benefit, that’s not real capitalism. If you want to see what happens with capitalism without democracy, you can see it very clearly in Russia. It turns into crony capitalism and that turns into oligarchy.